TSE innovated the double-diaphragm HOT (High Output Technology) chamber used worldwide for disc brake applications. Now TSE has taken disc brake actuators to the next level with the ultimate in product durability and corrosion resistance. Full immersion electro-deposition coating inside and out and an exclusive powder coating finish for the most durable corrosion protection in the industry. New TSE all-n-one self-guided recessed pressure plate. Diaphragms are factory sealed to pressure plate. Assures proper alignment to extend life of pressure plate, diaphragm and power spring. UL-Disc features a unique composite port adapter which reduces profile size and allows for easy air connection. 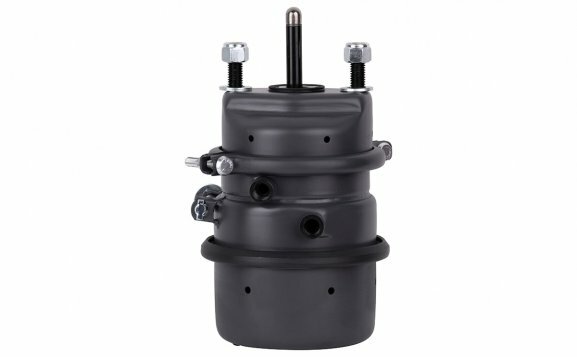 Patented bushing assembly provides center seal that traps lubricant for extended service, reducing center section leaks and brake drag. Premium diaphragms feature high quality contaminant resistant rubber reinforced with nylon fabric tested well beyond the toughest industry specifications. All steel design provides durable, air tight center section that virtually eliminates leaks, structural failures and prevents galvanic corrosion. TSE designed High Vibration "HV" mounting base reduces vibration for longer life standard on UltraLife products. UL-Disc features a 100% steel inverted spring bottom housing that reduces both spring coil-to-coil contact and spring coil-to-spring housing contact. The all-steel design provides a durable, air-tight center section that virtually eliminates leaks and structural failures, while the recessed pressure plate allows for a shorter and more compact chamber. TSE is an ISO 9001 and KBA certified company. As an OEM premium direct fit and aftermarket replacement, UL-Disc is the premium brake for your heavy-duty disc brake trucking application. UltraLife main spring adds a proprietary base coating in addition to TSE's multi-stage coating system for the ultimate in corrosion protection. Tested to double SAE standards, UL-Disc’s main spring actually exceeds SAE dry cycle testing requirements in a slurry environment. With TSE’s exclusive in-house process, all parts of the UL-Disc actuator receive a multi-stage pre-treatment prior to e-coat and an extra layer of polyester powder coating protection.